Go ahead and take a ride through some neighborhoods and try to find homes that have NOT been engulfed by overgrown landscaping. Windows, architectural elements, walkways and more are obscured and the beauty of the home is diminished. Walkways, steps, and patios are actually blocked and hinder usage. Unfortunately, the properly well done landscape is the exception. The purpose of this article is to educate you to think about proper plant material selection and placement. 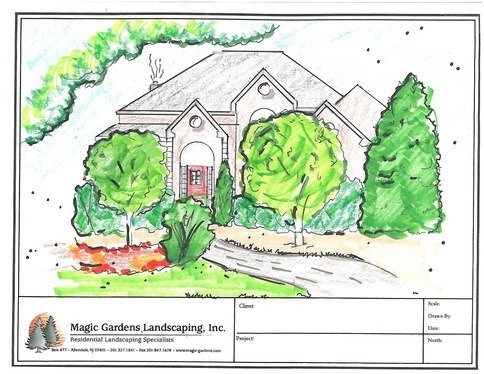 Done correctly, landscaping can beautify and compliment a home adding value for decades. Done poorly it increases maintenance costs, decreases value and becomes an eyesore. Landscaping is not supposed to hide the home or block windows. It is supposed to compliment the home with texture, color, fragrance, contrast and of course beauty. Good Landscaping will enhance and frame the home, bad landscaping competes with the home and confuses the eye. Many times a property is plagued by numerous spirals, pom-pom’s, circles, squares bushes etc. I am here to tell you… that is not landscaping! We truly can do better than this. Landscaping isn’t a collection of “shrubberies”. Landscaping is well chosen plant material and hardscaping that compliments its environment. It does not seek to confuse you, it should soothe you and enhance your day by providing subtle beauty. The root of the problem is improper plant selection and placement, compounded by poor landscape design. The value of any property is significantly increased when the landscaping is done properly the first time through, unfortunately, that isn’t always the case. When your home is hidden by overgrown landscaping you should consider a landscape renovation. Done properly it will significantly improve the appearance and value of the home. Proper plant selection and placement will ensure the new landscaping will stand the test of time. Mature size of the plant material is carefully considered and influences placement and selection. Proper hardscape design also allows enough horizontal space so the plant material does not get crowded. I often see walkways extremely close to the front foundation. This approach does not allow enough room for plants and as mentioned usually ends up blocking walkways and pedestrian traffic. Patio Design: Patio or Furniture First?